ABSTRACT: Taking as its focus a piano solo work by the British composer Bryn Harrison, this article focuses on the manner in which complex rhythmic notation functions not (or not simply) to specify a sound object, but to prompt a performative interaction between pianist and score—an interaction that needs to be renewed on each occasion of performance. It is based on documentation of the first performance, given by Philip Thomas, including recorded rehearsals and interviews with both composer and pianist. I take as my starting point an argument that I’ve made in another article:(1) that you can’t draw a categorical distinction between the kind of improvisation found in jazz and the kind of performance “of” pre-existing scores characteristic of the Western “art” tradition. The impetus to make this kind of categorical distinction comes from the literature of jazz, perhaps as a result of critics and musicologists who seek to construct their own cultural identity in opposition to the perceived hegemony of thinking associated with the Western “art” tradition. (Move outside academia and that might seem an absurd contention in relation to the actual hegemony of popular musics, but that would be a third article). I can focus what is at issue through two diametrically opposed quotes. On the one hand, Ingrid Monson writes that “meaningful theorizing about jazz improvisation at the level of the ensemble must take the interactive, collaborative context of musical invention as a point of departure. This context has no parallel in the musical practice of Western classical composers of the common practice period”. (2) On the other hand, Alfred Schutz writes that “there is no difference in principle between the performance of a string quartet and the improvisations at a jam session of accomplished jazz players”. (3) Reconciliation is impossible; the standoff could hardly be more complete. And whereas Potter isn’t talking about music of the common practice period, the sort of approach he is putting forward is just as applicable to, say, a Mozart quartet. What happens in the performance of music like this? The players may well play the notes exactly as Mozart wrote them. And yet they don’t play them exactly as Mozart wrote them, because every note in the score is subject to the contextual negotiation of intonation, precise dynamic value, articulation, timbral quality, and so forth. For example, the performers stay in time not because each accommodates his or her playing to an external beat (as when studio musicians record to a click track), but because each is continuously listening to the others, accommodating his or her timing to the others’, giving rise to a shared, communal temporality. This kind of social interaction takes place in the interstices of the score, in the zones of indeterminacy incorporated within it: either because the notation doesn’t specify something at all (timbre, for example, beyond the specification of the instrument), or because the score supplies a categorical value that isn’t intended for literal execution but instead needs to be negotiated and refined in performance. Monson argues for an understanding of musical structure that has “as one of its central functions the construction of social context”. (6) She is thinking of jazz, but any Mozart quartet embodies this: the score choreographs a series of ongoing social engagements between players, setting up a shared framework or goal (a shared mission, if you like) but delegating detailed decisions to be made in real time by the relevant individuals in light of local conditions—to be improvised, in short, as so much in everyday life is. A Mozart quartet is not just a representation but an enaction of community. I have argued elsewhere(7) that there is a mismatch between the everyday practices of musical culture and the composition-centered, which is also to say score-centered, ways in which musicologists represent that culture, and I don’t want to repeat those arguments here. In brief, the principal source of this orientation towards the written text lies in the origins of musicology within the nineteenth-century project of nationalist philology; this gave rise to the idea that meaning is inherent in the text, so that performing it becomes an act of reproduction, something essentially peripheral to musical culture (in the same way that reading aloud is seen as peripheral to literary culture). A further formative influence on musicology was the cult of the composer that began in Beethoven’s lifetime and reached a climax around a century later. The idea of the musical text that results from this is rather different, in that it is seen as a vehicle for the composer’s voice, so that the performer’s job becomes less one of reproducing the text than of conforming to the intentions behind the text; on this model, meaning may not be inherent in the text—but it is still predefined, so that performance remains a matter of getting it right, of adequacy, rather than of contributing in a fundamentally creative manner to the generation of musical meaning in real time. But having said this, we don’t really believe that performance is such a banal activity as this would suggest. There is, that’s to say, a mismatch between what we believe and the conceptual apparatus at hand for expressing those beliefs. Yet the score of Bryn Harrison’s être-temps might look like a vindication of the “performance as reproduction” paradigm. 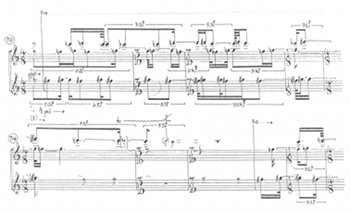 On the fourth page, for example (Example 1), there are two broadly similar passages ending in a trill, and Harrison employs a device borrowed from Morton Feldman: the same pattern of irregular time signatures appears on each system within a page (the next page is completely different). What is basically happening is that the same musical material is being passed through different metrical grids, or more precisely it's being passed through the same metrical grids but offset. That means that the composer has to look for a different pattern of rhythmic approximations each time the material appears, as it were presenting it from a different metrical perspective, so that as Harrison puts it “I think what you . . . get in a good performance is a sense of this spatial contraction and expansion and things going softly against each other”. BRYN HARRISON: Obviously I’d like to think of the player as aiming for as much rhythmic precision as possible, and in fact although I’d have to go over and really work out those figurations myself to know just exactly how accurate that is, I think what you . . . get in a good performance is a sense of this spatial contraction and expansion and things going softly against each other. Clarke analyzed the MIDI data of various passages from être-temps in order to measure the extent to which Thomas’ playing actually corresponded to the specifications of the score. Of course, it’s not entirely obvious what the best way to measure this might be, given the textural as well as rhythmic complexity of the music, with what are notated as three interlocking lines—though the effect isn’t of three independent lines but rather of a more homogeneous, rippling texture. 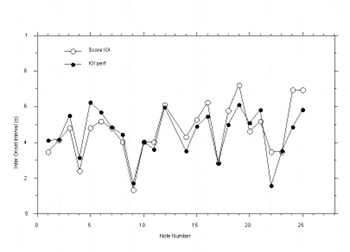 Clarke’s first approach, as you might expect, was to measure how accurately each note was timed, treating the texture as a single, composite series of attacks: Figure 1< shows the data for the top line of page 4 (measures 70–73), with the open circles showing the notated values, and the filled-in ones the performed ones. (Thomas’s performance of the whole of this page at the premiere is reproduced as Sound Example 1.) Without going into details, the overall durational profile is reproduced reasonably accurately, but there is little correspondence in terms of rhythmic detail; that would be compatible with the cynical view of notational complexity I put forward in the previous paragraph. Each of the three lines has its own internal energy, which is difficult to sustain throughout its duration. I felt that the only way to learn this was to get to know each line on its own, and then in pairs before putting them all together, much like Bach counterpoint. In order to ascertain the degree to which a note in one voice occurred very soon after or just quite soon after another voice I would in some cases have to calculate the relationships to the nearest hundredth of a second to be sure of the correct order, and temporal proximity, of the events. When putting everything together I would then find points that I could identify as markers, such as a downbeat in one voice which the other voices could respond to, always trying to hear the individual energy of each line as learned on its own. ERIC CLARKE: But God, I mean it’s, does he really want it so, I mean, you know, like the second bar of page 6, you’ve got a 3 in the time of 2, within a 6 in the time of 5, within a 5/16 bar . . .
PHILIP THOMAS: Oh, but that’s not complicated, really, that’s, forget the six in the space of five, so if you played it without the six in the space of five it would be [sings], and six in the space of five simply means it’s a little bit faster, so those two bars would be [sings], you just simply nudge the beat on a bit faster. . . . I mean it’s correct as I, I mean, hearing it on the Disklavier, if someone was going to really meticulously see the timings of that, then it would be different every time. I’m not going to be, it’s not going to be exact. . . . I hope no one listens to music really hearing things as they are, 6 in the space of 5. . . . It’s just a notational device which encourages me to just move on a little bit here. PHILIP THOMAS: This is a classic kind of notational device to prompt the performer to respond in ways which will always keep it floating and never rooted in anything, always keep it changing. . . . It’s not highly calculated stuff, it’s more a way of just inspiring the performer to do certain kinds of things, and hopefully the listeners won’t be thinking about how is that notated too much, you know, as you say, it’s just this constantly fluctuating, it’s a wash of sound, the same notes the whole time, just the pedal down, I think it’s very beautiful. PHILIP THOMAS: How does it feel the last section, when it’s more complicated rhythm between the two hands? BRYN HARRISON: You can feel the change from something that is in one metre to two, definitely, you get a slight feeling of acceleration as well, which is nice. PHILIP THOMAS: Do you think it’s accurate? I think I’m pretty accurate. BRYN HARRISON: As far as I can tell, I’m struggling to tell. . . .
PHILIP THOMAS: You kind of do it so much, I’ve practised it, and then you get used to it, and it gets compromised again, so I’ve got to keep kicking myself in the arse to kind of take it apart again, I think that’s the problem, I’ve got to keep unraveling it. BRYN HARRISON: Otherwise you get used to the sound and keep imitating yourself in a slightly inaccurate way really. As I devise a strategy for counting, a certain energy is created in my mind which impacts upon the articulation of the gestures. Page 5, for example, consists very simply of the same three-note cluster repeated at different dynamics, with slightly different durations, and positioned irregularly throughout the page. The complexity of the counting needed to measure accurately the lengths of the intervening rests is, of course, unheard by the listener; but the impact of that counting upon the articulation of the cluster across time is such that each sound has its own energy. If Bryn had notated this using either a simpler rhythmic strategy, or space-time notation, that energy would, I suggest, be noticeably lacking. The result is that in terms of human activity there is a real difference between performing and, so to speak, merely imitating the sound that performance makes. This is something that Thomas spelled out in his interview, too, in connection with the idea that you can perform Ferneyhough’s music by reducing the rhythms to a simpler metrical framework which can then be subjected to nuance, so reproducing more or less the effect of the original notation: This kind of simplified transcription, Thomas complained, suggests that the original notation is needlessly complex—“and it is a completely ridiculous notion”, he added, “because it’s as if rhythmic notation affects duration alone, but of course it doesn’t”. In this way the transcription “would sound entirely different from what Ferneyhough had written, the effect would be completely different”. The extent to which this difference—the difference in energy that Thomas spoke of—actually communicates itself to listeners is a question that could only be settled by further empirical work. But I hope I have said enough to establish the general point I wanted to make. We have here the kind of music that, with its abstract, mathematical notation, might be thought most amenable to the paradigm of performance as reproduction, and analysis of the MIDI recordings shows that accuracy of reproduction is achieved to a remarkably high degree. And yet, at the same time, an ethnographical approach reveals a quite different conception—what would once have been called a folk theory—and, presumably, a quite different pattern of intentional activity on the musicians’ part (for it is obvious from the transcript of the play-through session that Thomas and Harrison were thinking along very much the same lines). And here there are three points I would like to bring out. BRYN HARRISON: I wouldn’t want to feel I was one of those composers who feel that there’s no flexibility in terms of what the player can bring to a piece, I think that’s where the sort of human aspect comes in and I think that that’s the really, really important part of music-making as far as I’m concerned. BRYN HARRISON: Jasper Johns said that “Sometimes I see it and then paint it. Other times I paint it and then see it”. And I really like that quote, because I think in some ways the way that I’m dealing with rhythm and the setup on the page, it’s not purely deterministic in my point of view, even though you know, it’s carefully regulated on the page but in some ways I’m writing it to hear it, as much as I’m hearing it to write it. BRYN HARRISON: I think the thing I’ve learnt is that you don’t have to have the answers to every question as well, I think you know, when I first started getting performances and I’d go and attend rehearsals, you know I was, well I was probably scared stiff for one thing, but there was always this feeling that any question that a player had you had to feel you immediately knew the answer to that question, and of course you’ve got to trust their judgment as well. As well as creating a space for the creative contribution of the performer, in a way that the reproduction paradigm does not, these comments emphasize the extent to which the meaning of music is emergent, in other words to which it arises from the act of performance itself. The second point I’d like to draw out is that approaches to performance analysis that focus exclusively on recordings—on the acoustic outputs of performance—risk misreading or simply not grasping the social meaning inherent in the act of performance: much as I applaud the efforts that have been made in the last decade or two to develop a musicology of performance, we are vulnerable to the claim that the voices of performers have not really been heard, that theorists have as it were taken it upon themselves to speak for performers in a kind of ventriloquism. If that is the case, then the project I have been describing is in the most literal way an attempt to bring performers’ voices into the field of study, and the suggestion I am making is that ethnographic approaches have a great deal of potential for contextualizing the now more traditional approaches to the empirical study of performance. The final point follows on from this. When the “New” musicologists of the 1990s identified what they saw as a complicity between traditional musical analysis and the ideology of musical autonomy, they reacted against the whole of idea of “close reading”; the same happened when, a decade or two before that, theatre studies broke away from literary studies. But there is no need to throw away the baby with the bathwater, because there is not an either/or relationship between ethnographical, contextual approaches on the one hand, and the close reading of texts (under which I include both scores and performance data) on the other. Moreover, in music of the Western “art” tradition, this both/and relationship extends to the very topic of study. In the wake of Lydia Goehr’s influential book The Museum of Musical Works, there was a general tendency to debunk the idea of musical works, and it would be very easy to imagine a musicology of performance that went the same way as theatre studies. (Christopher Small’s writings, however valuable as a corrective to the then prevailing assumptions of mainstream musicology, provide an idea of what such a musicology of performance might look like.) Yet one of the characteristic features of the Western “art” tradition is the dual life of musical works: on the one hand as frameworks for a performance culture that is distinguishable from that of jazz improvisation only in terms of degree, not category; and on the other, as objects of contemplation or critical reflection, if only to that small but culturally influential circle of the musical literati. Here we see how despite the apparent rigidity of the barring structure that Bryn laid out for himself, he has used the bars to bring life to the material and not simply to contain it. These are examples of the notation playing a crucial role in the nature of the material. One could feasibly learn, say, a Beethoven sonata in a purely aural manner, simply through repeatedly listening to a recording: the correct pitches, rhythms, tempi, dynamics, and so on could all be learned in this way. But in être-temps, and much music like it, the visual appearance of the notation is fundamental to the character and production of the material: the notation and the material are inseparable. Yet I wonder if the contrast with a Beethoven sonata is as self-evident as it might appear. Certainly you could learn a Beethoven sonata that way. But such an approach runs counter to the established pedagogical view that you make music your own by going back to the score and creating your own interpretation of it. And after all, in principle you could (with whatever difficulty) do the same with Harrison’s music: the point Thomas is making isn’t really so much that this can’t be done, but that a certain energy—a dimension of the music that derives from the often uneasy relationship between score and sound, between written notation and acoustic realization—will be lacking. And if that is true of Harrison, then I see no reason to believe that it is not true of Beethoven as well. To say that there is more to musical performance than the sound it makes may sound merely flippant. But to do justice at one and the same time to the sight and the sound of music is perhaps the most challenging demand we face in making sense not just of musical performance, but of the tradition of Western “art” music itself. 1. “Making Music Together, or Improvisation and its Others,” The Source: Challenging Jazz Criticism 1 (2004), 5–25. 2. Ingrid Monson, Saying Something: Jazz Improvisation and Interaction (Chicago: Chicago University Press, 1996), 74. 3. Alfred Schutz, “Making Music Together: A Study in Social Relationship,” in Arvid Brodersen (ed. ), Alfred Schutz: Collected Papers II: Studies in Social Theory (The Hague: Nijhoff, 1964), 177. 5. John Potter, Vocal Authority: Singing Style and Ideology (Cambridge: Cambridge University Press, 1998), 178–82. 7. “Between Process and Product: Music and/as Performance,” Music Theory Online 7.2 (2001). 8. Eric Clarke, Nicholas Cook, Bryn Harrison, and Philip Thomas, “Interpretation and Performance in Bryn Harison's être-temps” (Musicae Scientiae, forthcoming), on which the following draws; I am grateful to my co-authors and to Irène Deliege for permitting me to reproduce materials from this publication. 9. Quoted in Paul Berliner, Thinking in Jazz: The Infinite Art of Improvisation (Chicago: University of Chicago Press, 1994), 192. “Making Music Together, or Improvisation and its Others,” The Source: Challenging Jazz Criticism 1 (2004), 5–25. Ingrid Monson, Saying Something: Jazz Improvisation and Interaction (Chicago: Chicago University Press, 1996), 74. Alfred Schutz, “Making Music Together: A Study in Social Relationship,” in Arvid Brodersen (ed. ), Alfred Schutz: Collected Papers II: Studies in Social Theory (The Hague: Nijhoff, 1964), 177. John Potter, Vocal Authority: Singing Style and Ideology (Cambridge: Cambridge University Press, 1998), 178–82. 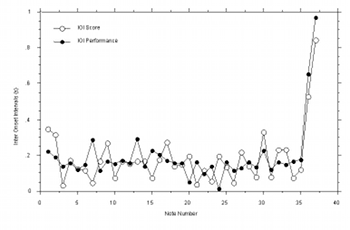 “Between Process and Product: Music and/as Performance,” Music Theory Online 7.2 (2001). Eric Clarke, Nicholas Cook, Bryn Harrison, and Philip Thomas, “Interpretation and Performance in Bryn Harison's être-temps” (Musicae Scientiae, forthcoming), on which the following draws; I am grateful to my co-authors and to Irène Deliege for permitting me to reproduce materials from this publication. Quoted in Paul Berliner, Thinking in Jazz: The Infinite Art of Improvisation (Chicago: University of Chicago Press, 1994), 192.